Happy Friday! It’s the last weekend before Christmas and if you work in retail or having planed ahead to do your shopping then you’re probably pretty stressed out right now. 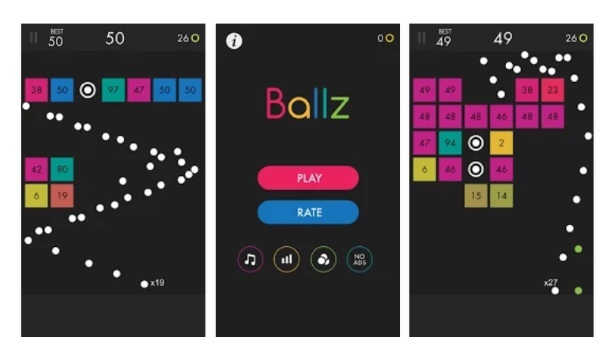 Take a couple of minutes of you time and check out Ballz, the game to relax your brain. This is a really simple game. Just swipe your finger to throw the ball. The ball hits bricks and breaks them. Try to break them all before they make it to the bottom. Collect items to get more balls, dominate this easy to play app. There aren’t any puzzles, no confusing rules. Just throw ball, break blocks. Each round you get more bricks on the screen. Although it’s a simple game, getting the high score can be tricky. Still, it’s free and there’s endless gameplay which means you will have something to do while you wait in those long, las minute lines. Happy holidays!